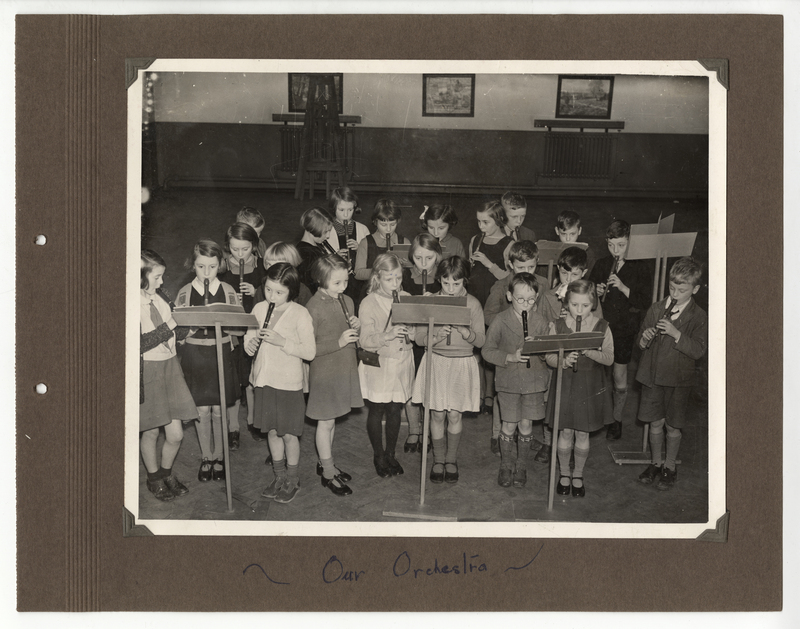 Tinkers Farm Road School orchestra. BAH: Tinkers Farm Road School Album p.18. Children in Costume. 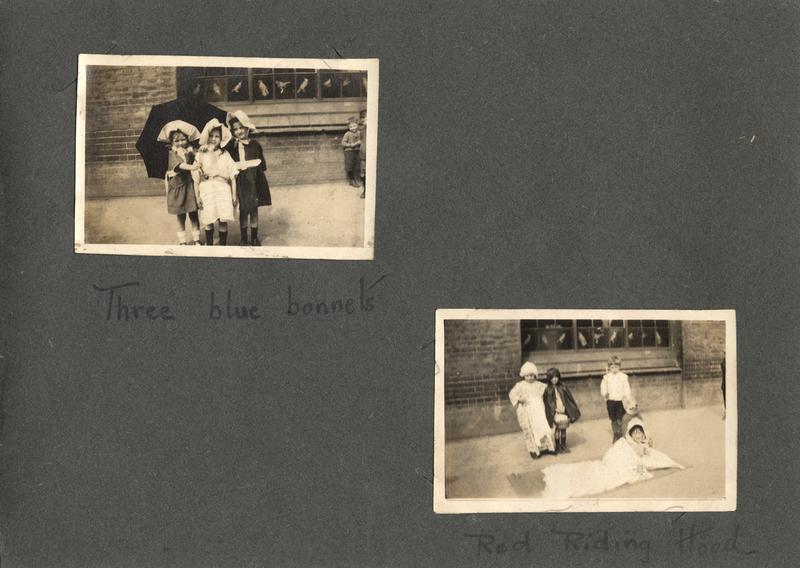 BAH: Floodgate Street Board School Album p.8. However, sometimes the parents caused trouble for the school. Those truanting and sleeping out often had a reason for avoiding home, such as drunken parents. [S68/2/1 14.10.1898] One drunken father even attacked the head Teacher at Floodgate Street School when he was refused permission to remove his daughter from school. [S68/3/1 25.8.1937] He received a month in prison for the assault and two weeks for being drunk and disorderly. “9.00 am “B’ham Mail telephoned re Woodward story. The theoretical involvement of parents was therefore important, but sometimes their actual involvement left children away from classes they should have been benefiting from. The teachers themselves, it seems, were as familiar with misbehaving as the children were. One teacher at Floodgate Street School was repeatedly warned to follow the school timetable rather than his own [S68/3/1 8.9.33, 16.10.33]. Two teachers were also caught smoking during the break time. One should have been supervising the children, and smoking in school was strictly prohibited. [S68/3/1 26.5.37] No mention of their punishment was recorded, although the tone of the logbook suggests that it was a stern talking to. Oct 25: …Mr. Routledge + his sister were both away. I left school at 11.10 + called at their home – They were both out. Oct 30: Miss routledge returned today. She has forwarded a Med. Cert. to Offices re her absence. Just what the two teachers were doing is never stated, but it would have been difficult for the children to miss these events, particularly as one of the children was a witness to their absence. It would appear that gossip and rumours at the expense of teachers were always a part of the school day. 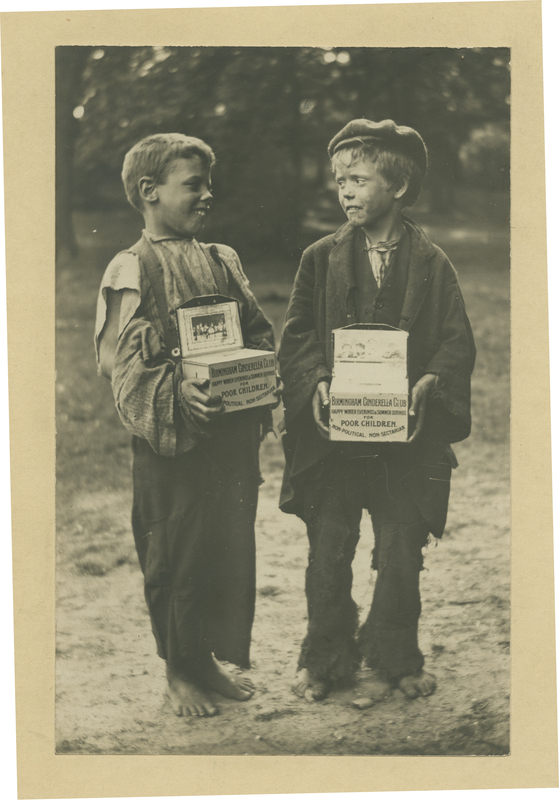 Two Boys in Sutton Park with Collection Boxes c.1898. BAH: WK/B11/441. 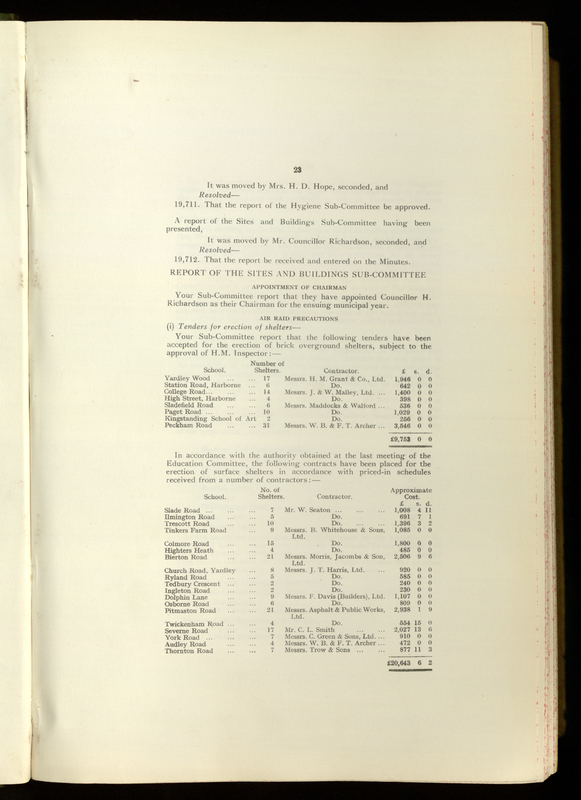 Floodgate Street school logbook records that a donation of food from G. Hookham fed 165 children for breakfast [S68/2/1 22.1.1901]. This is presumably the electric company businessman of Chamberlain & Hookham, an early 20th Century Birmingham business. 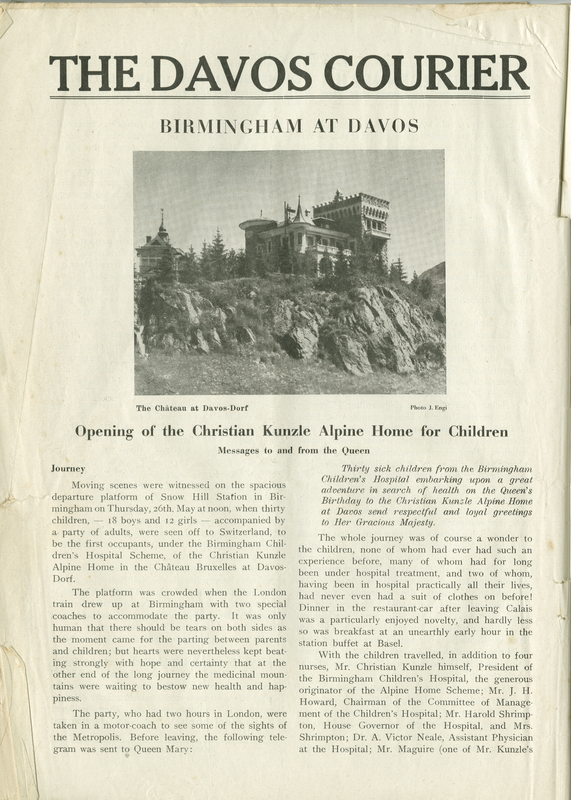 The Davos Courier reports on the home for sick children. BAH: HC/BCH/6/3/2 p.1. Birmingham’s lesser-known chocolate maker Christian Kunzle (1879-1954) was born in Switzerland, and used to send children recovering from TB to his home for sick people in Davos to recuperate in the clean air. The factory used to be situated on Fiveways at the end of Broad Street. Floodgate Street logbook also recorded the generosity of a Mr Kunzle who sent the school “a huge parcel of chocolate” in 1933. 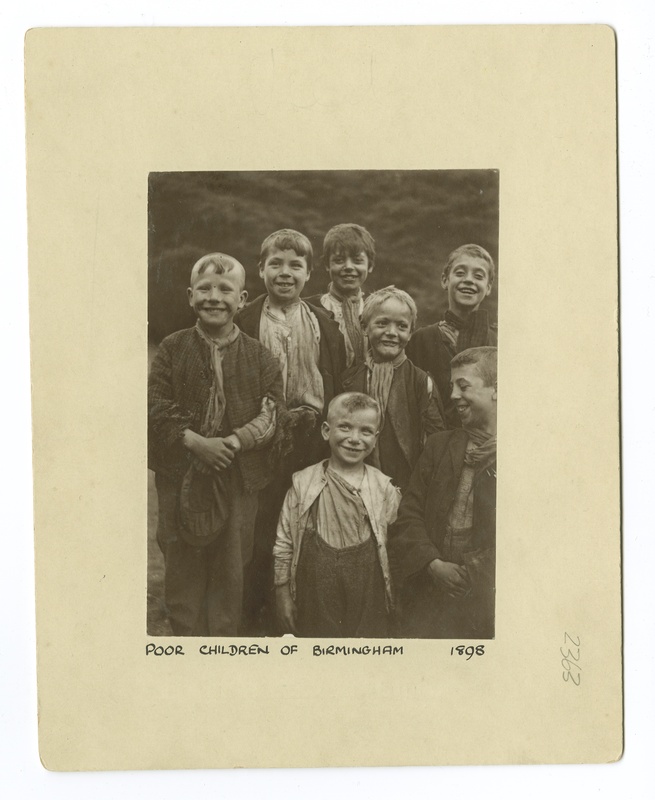 [S68/3/1 1.6.1933] The children were each given a bag of chocolate when they left for the summer holidays. In 1896 Floodgate Street School’s head teacher was forced to change how he administered corporal punishment. There is no recorded end to this dispute, but the lack of a further entry suggests that the Head was satisfied that the injuries had been sustained outside of school, and not by the accused teacher. Truanting; fighting; punching; disobedience; smoking in school; careless written work; being an annoyance; swearing at a teacher; writing swearwords on a wall. These were all offences recorded as reasons for the use of corporal punishment in Tinkers Farm School punishment book [S 200/2]. 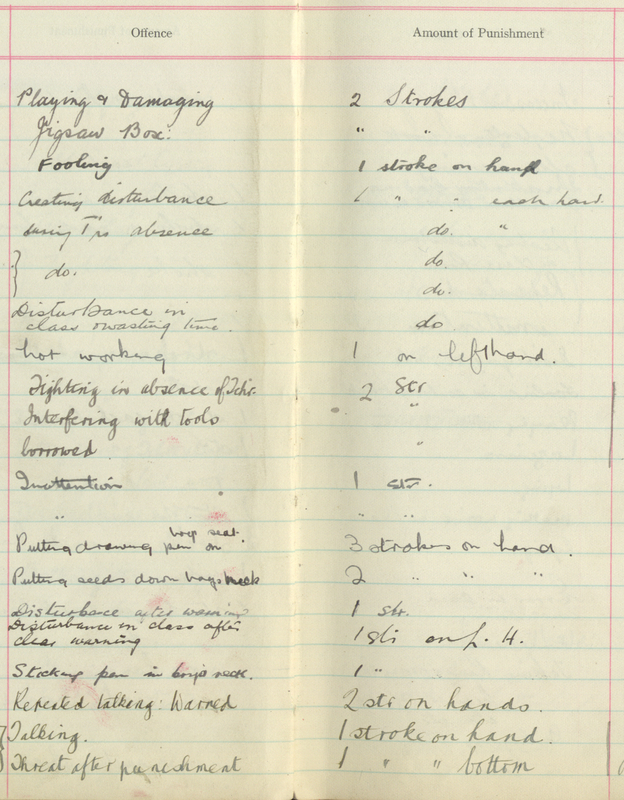 A list of offences and punishments from Tinkers Farm Road School, 1934. BAH: S200/2. 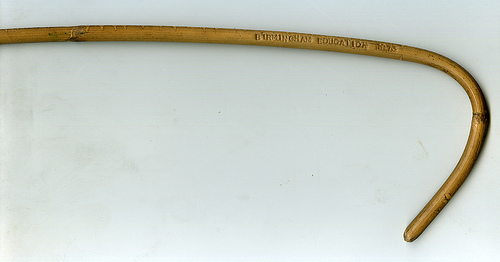 Corporal punishment was outlawed in UK government funded schools in 1987. The school logbooks from the 1890’s provide ample examples of its use in daily school life. The careless written work had demanded one stroke on the right hand, presumably the offending hand, whereas swearing was punished by two on each. 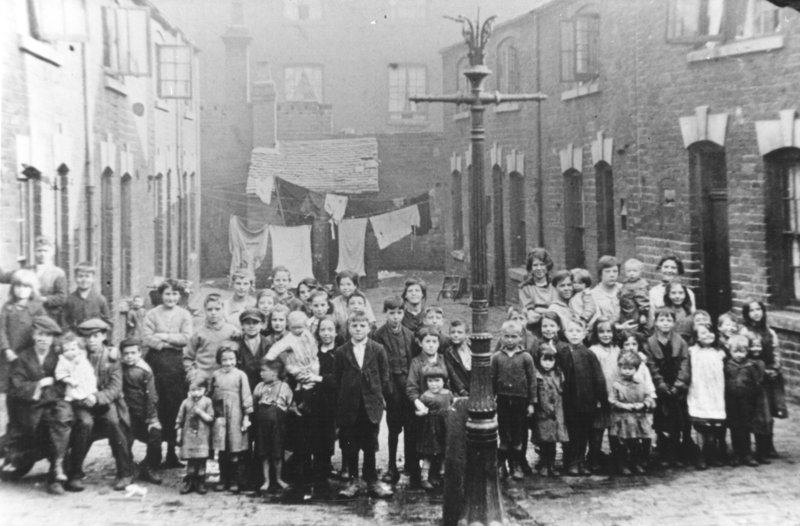 In 1892 Floodgate Street School was unusual in obtaining permission to inflict corporal punishment on girls, but it was still mostly boys who were recorded as receiving punishment. The language used to describe corporal punishment at Floodgate Street School is notable, with the headmaster being “compelled to cane several boys for truanting and lying” [S68/2/1 15.5.95], and writing that he “Had to cane persistent late comers” [S68/2/1 25.11.92]. It implies that the headmaster had no choice other than to physically punish those misbehaving. There are numerous examples of punishments being claimed as excessive and often the head teacher investigated these. Sometimes these complaints had to be referred to the School Board for jurisdiction. On one occasion at Floodgate Street School this involvement became complex and the head teacher’s decisions challenged. These entries will be posted next. When the teacher was right inside the gymnasium the boy attacked her with a policeman’s truncheon, inflicting severe head wounds – cuts extending several inches – and much haemorrhage. First Aid was rendered – the police and ambulance summoned and she was conveyed to selly oak hospital where she was detained. 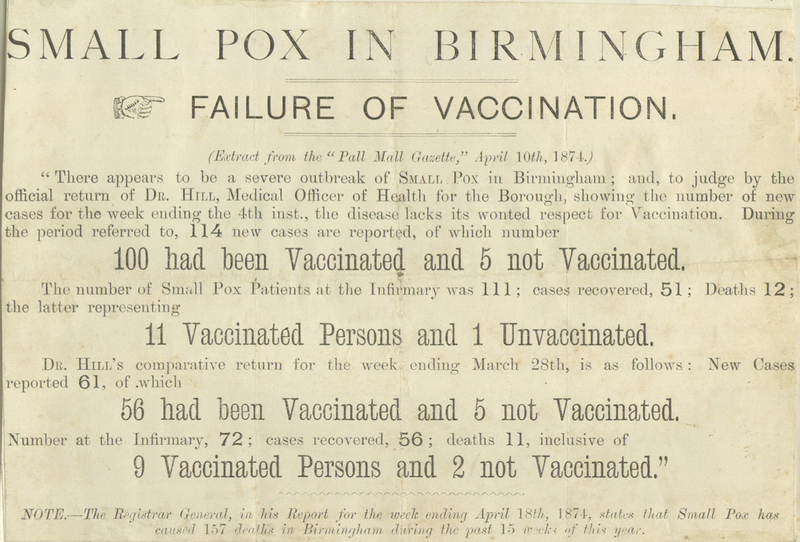 Despite the shocking and morbidly fascinating nature of this case it does not appear to have been reported in Birmingham’s local newspapers. The circumstances leading up to this attack will therefore probably never be known. For instance, where did the boy get a policeman’s truncheon from? Why this teacher? What did the doctor’s report recommend afterwards? Most people can remember at least one occasion where either they were hurt at school, or someone else was. Chipped teeth, bloody noses, flying board rubbers: this violence in the form of injuries was and is an inevitable part of the school experience. The Logbooks of Floodgate Street and Tinkers Farm School witness these same experiences in the late 19th and early 20thCentury. 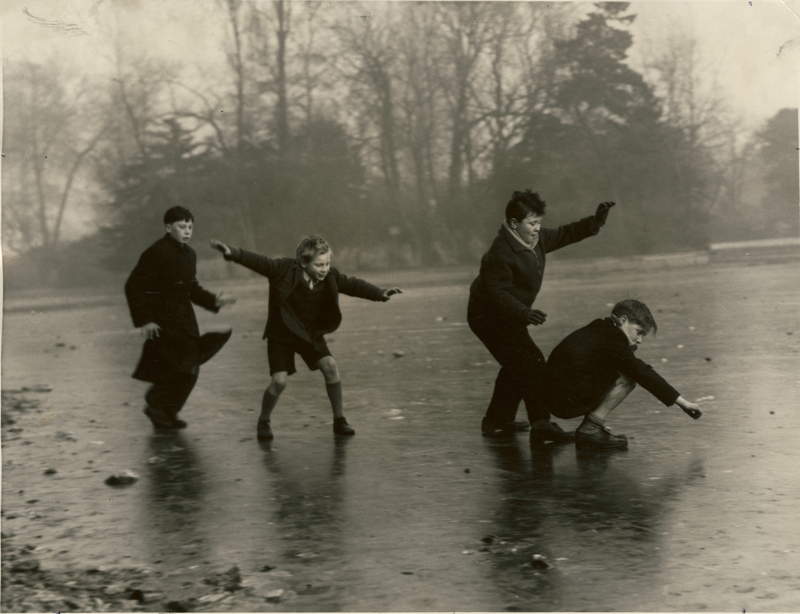 Children Ice Skate in Canon Hill Park. The logbooks record many injuries sustained on ice! BAH: WK/E1/921. Hopefully these events also acted as cautionary tales for those who witnessed and experienced them. It is unlikely that the girl who swallowed a pin would ever do it again after having to spend five days in hospital. [S199/1/1 6/12/45] However, the Logbooks do occasionally record genuinely violent events, as will be seen next. The Education Committee admitted in 1939 that education for those left in the evacuation areas would not be as good as for those in the reception areas. 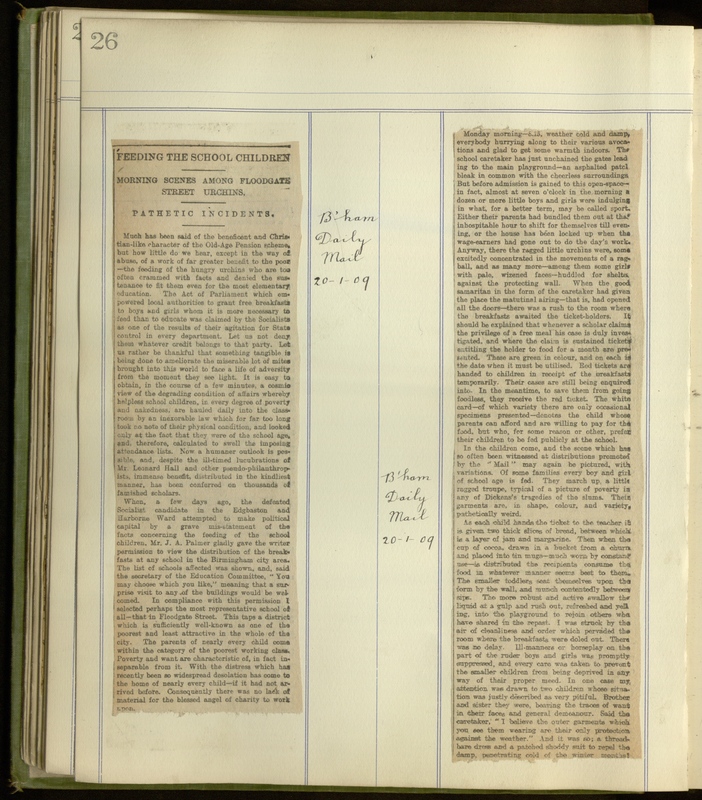 [BCC 1/BH/1/1/1/38 p.15] Providing suitable education and protection for those that had not been evacuated became essential. Tinkers Farm Road School reopened on a voluntary basis on 26th October 1939, and on a compulsory basis in January 1940. During this time air raid shelters were built. 9 shelters were built at Tinkers Farm at an estimated cost of £1,085. Air raid shelter figures included accommodation for 850 children at Tinkers Farm. BAH: BCC BH/1/1/1/38. Tinkers Farm Senior Logbook records many of the air raid warnings during the 1940s, including one event during morning assembly where a plane and gunfire were heard. [S200/1 5.9.1940] The Head Teacher also recorded the falling of bombs in the neighbourhood. 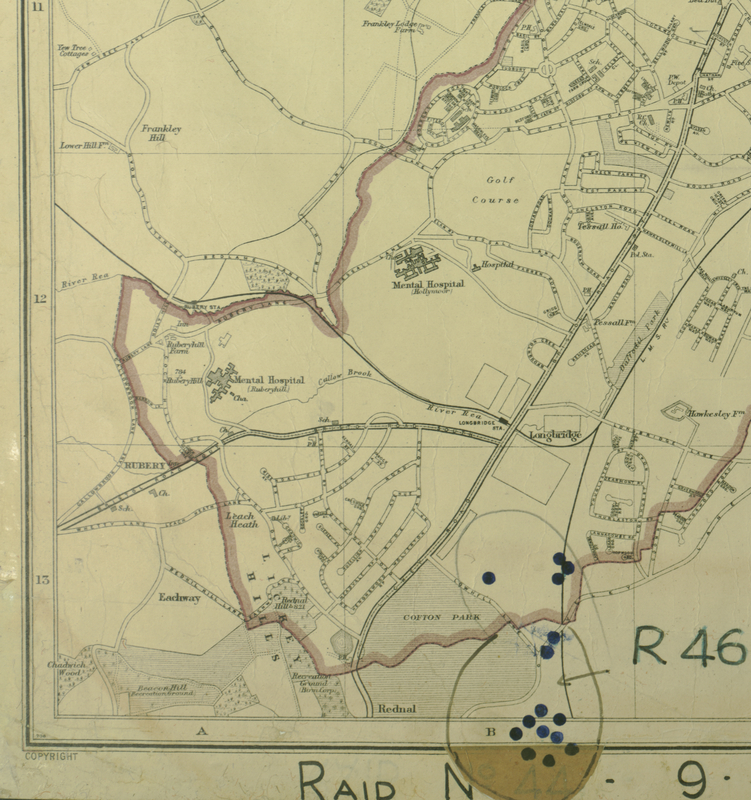 [S200/1 13.11.1940] Birmingham’s surviving air raid maps show a cluster of bombs near Litchfield on this evening. Birmingham Air raid no.46 fell close to Tinkers Farm Road School (top right). BAH: LS/8/29.